Welcome to Spring!!! Let’s celebrate with bright colors, whimsical images, and (of course!) butterflies. Below is a picture of the third card that we made at our recent Stamp Club. Butterflies just make me smile! 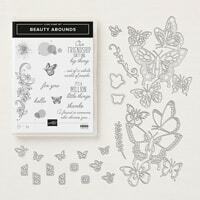 The Beauty Abounds bundle has very bold images and versatile sentiments. 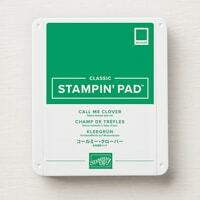 It really is a great addition to anyone’s stamping stash. Remember – Sale-A-Bration is ending on March 31. When you purchase the Beauty Abounds bundle, you will qualify for one FREE Level 1 Sale-A-Bration item!! Don’t wait to order your bundle and take advantage of Sale-A-Bration before it’s over! 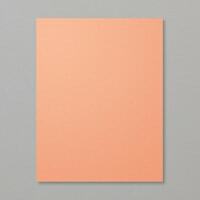 The card base is a piece of Grapefruit Grove (gorgeous In-Color!) card stock cut to 4 1/4″ x 11″ and scored at 5 1/2″ on the 11″ side. 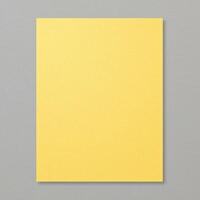 The main focal point starts with a piece of Whisper White card stock cut to 4″ x 5 1/2″. 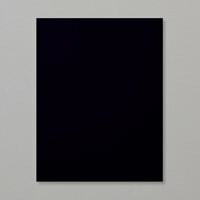 You’ll notice that there is a piece of Basic Black card stock behind the Whisper White piece. This was taken from a scrap strip that I had. You can adjust the Basic Black piece to the width that you would like. Tuck the piece behind the Whisper White piece, adhere the Basic Black piece, and cut it to the same length as the Whisper White piece. Essentially, create your own background on the Whisper White piece by using three stamps from the Beauty Abounds stamp set. They are the two bubble stamps and the grunge spec stamp. 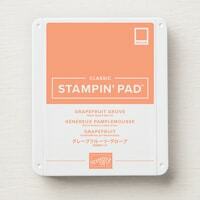 Grab your Grapefruit Grove and Call Me Clover ink pads and three clear blocks. I used Grapefruit Grove ink to stamp the bubbles onto my background. Also, I used various strengths of the ink to give variety. 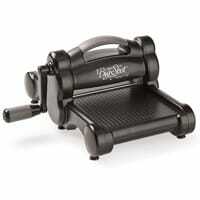 You can get various strengths of your ink by stamping multiple times without reinking. For the grunge spec stamp, I used the really pretty Call Me Clover ink. Again, I used various strengths of the ink for variety. Tip: When you stamp one of your images on the side of the Whisper White card stock, be sure to reink your stamp before stamping a second time. If you don’t, your second stamped image will have a line where you stamped on the edge of the card stock. 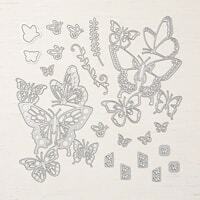 Next, I cut out two die cut butterfly images from the Butterfly Beauty Thinlits dies. One was cut from Daffodil Delight card stock, and the other was cut from Basic Black card stock. You will be able to tell the difference between the two large butterfly dies in the set by looking at the thickness of the butterfly bodies. The die that has the thicker bodies is meant to be on the bottom, and the die that has the thinner, more detailed images is meant to be on the top. 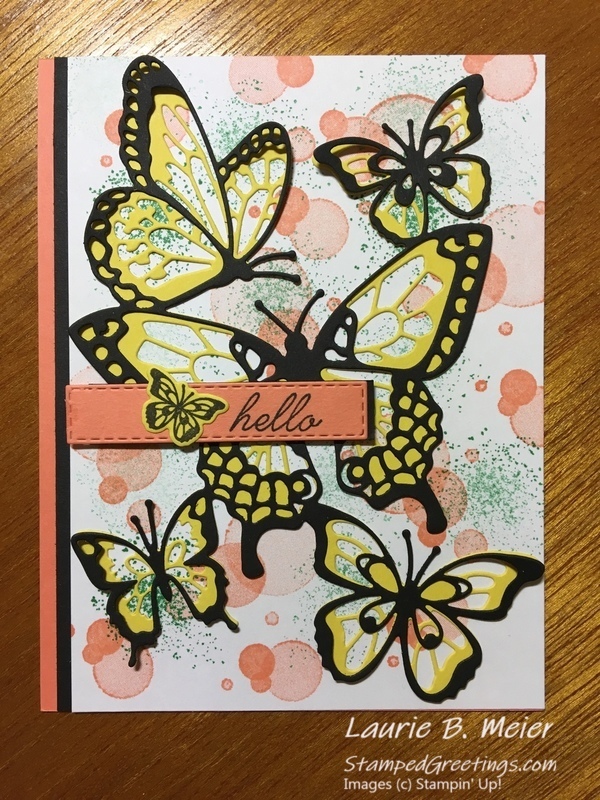 Tip: I cut off the antennae from all the butterflies on the bottom die (the one cut from Daffodil Delight) to make sure only the Basic Black antennae showed on my card. 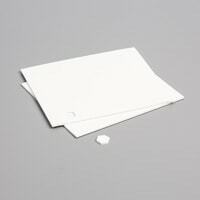 To assemble your card – Adhere the Whisper White/Basic Black card stock piece to the front of your Grapefruit Grove card base. Next, adhere the Daffodil Delight butterfly die cut to the Whisper White piece. Then, adhere the Basic Black butterfly die cut onto the Daffodil Delight butterfly die. Tip: For the Basic Black butterfly die cut, I put adhesive only on the bodies of the butterflies and some of the thicker outline pieces of the wings. First, I adhered the body of the middle butterfly and then adhered the additional pieces. I purposely left some of the parts of the wings without adhesive to give more of a fluttering effect. The last piece for the card is the sentiment. 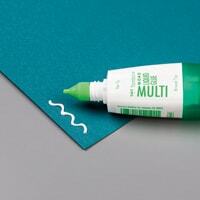 The new, must have, likely to be used on almost every card you make (no kidding!) 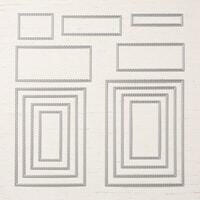 Rectangle Stitched Framelits Dies are the key for the sentiment! Use the smallest die in the set to cut a Basic Black rectangle. 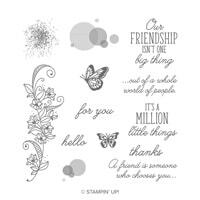 Stamp “hello” from the Beauty Abounds stamp set onto a piece of Grapefruit Grove card stock with your favorite black ink. Die cut that piece using the same die you used to cut the Basic Black rectangle. I purposely die cut the sentiment to the right of the rectangle to allow enough room for my die cut butterfly. 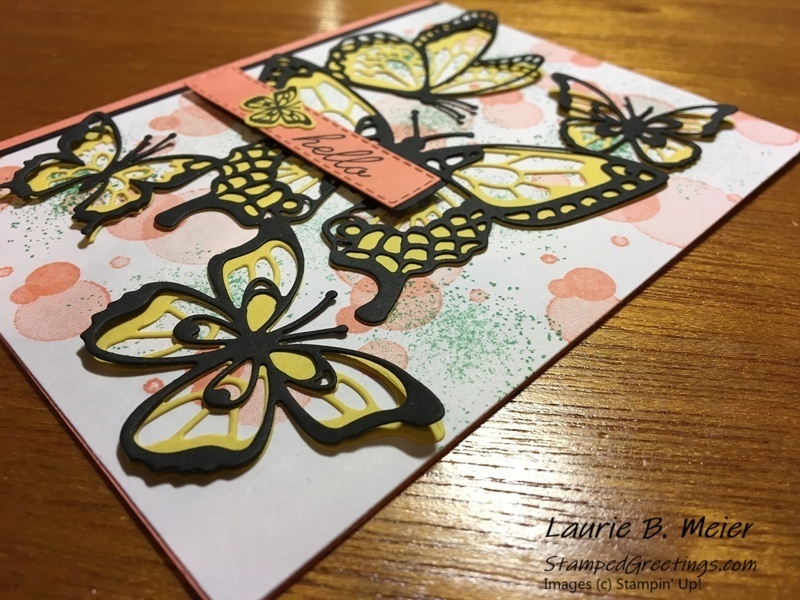 Stamp the small butterfly from the Beauty Abounds stamp set onto a piece of Daffodil Delight card stock with your favorite black ink. Die cut the butterfly image using the corresponding die from the Butterfly Beauty Thinlits Dies. Assemble the sentiment by first adhering the Basic Black piece behind the Grapefruit Grove piece. Notice that I adhere the pieces together allowing the Basic Black piece to show just a bit on the right side of the Grapefruit Grove piece. Adhere the die cut small butterfly as shown. Finally, attached your sentiment piece to the card with dimensionals, as pictured. I hope you enjoy making this card and sharing the joy and beauty of spring! Below are pictures of the main products that I used to make this card. 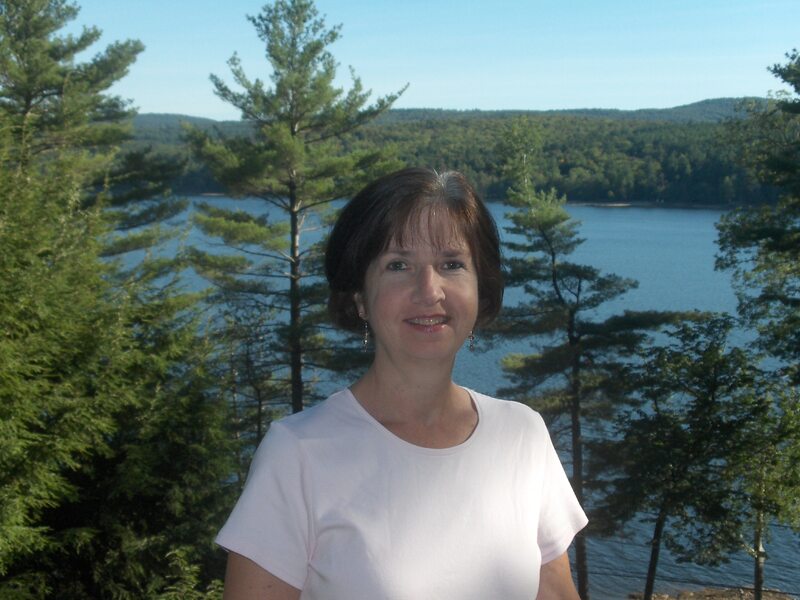 Click on any picture and you’ll go directly to my on-line store! And, remember Sale-A-Bration will end on March 31!